Need A Flooring Contractor in Bridgewater? 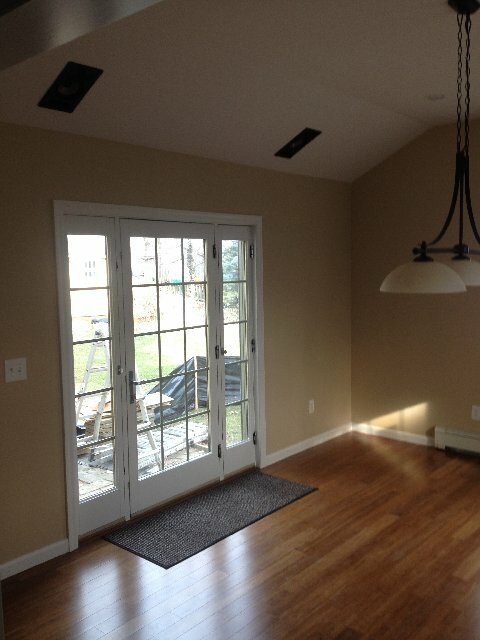 Allure Home Improvement & Remodeling, LLC provides quality flooring installations for residential and commercial clients in Bridgewater, Connecticut. We've been installing floors in CT since 2007. From hardwood to tile, and everything in between, Allure Home Improvement & Remodeling, LLC will install your floor professionally. Our flooring experts measure all areas precisely, so you don't spend more money on flooring than you should. Call (203) 212-8252 today for a free estimate. There are more flooring choices in Bridgewater now than ever before. Sustainable choices, like bamboo and cork, have become more popular and more reasonably priced. Hardwood flooring continues to be a classic choice. Laminate flooring can give you the look of stone or wood for a much lower price. We have more than 12 years' experience installing flooring in Bridgewater. No matter your flooring budget, rest assured that Allure Home Improvement & Remodeling, LLC will hold each job to the highest quality standard. We use fine wood, tile and stone flooring products and the best Bridgewater flooring contractors to install your residential or commercial flooring. Whether you want economical vinyl flooring in your office space or mudroom, or gleaming marble in your dining room, Allure Home Improvement & Remodeling, LLC will make it look great. All work is guaranteed. 5★★★★★ - "Working with Jon from Allure Home Improvement was a very positive experience. Right from the beginning, everything was explained clearly and in detail. The workmanship was excellent and all the work was done in a timely matter as promised. Jon kept us well informed throughout the whole process. We were very pleased with the way all parts of the project turned out. We would not hesitate to refer Jon to anyone who might be thinking about an in home project or a remodel." 5★★★★★ - "It has been an absolute pleasure doing business with Jon Pimentel, owner of Allure Home Improvements and Remodeling. Right from the start the line of communication was excellent which is a primary reason that I hired Jon to do this project. He was neither the highest or lowest bidder for this project. Right from the beginning, he kept us advised of every step of the project. All of the work done in the house met and exceeded our expectations. Everything was done meticulously and in a very timely manner. I would not hesitate for a minute to use Jon for any other project I might want to do in the future. I would highly recommend Jon to anyone who might be looking to remodel or upgrade their home. You will not be disappointed but you may be amazed by the quality workmanship. I certainly was." 5★★★★★ - "When picking a contractor, you can tell when someone is serious about doing a job correctly from the start and who is just giving you a quote to give you a quote. Jon from the beginning explained all costs for my deck project and the quote he gave included the breakdown of all of the work including parts and permits and was honest about everything from the get-go. Fast forward to the workmanship, all of it is great and exceeded my expectations. I'll have people over and they'll compliment even the little things like how well things are cut to fit together. Coming from a family of contractors, I appreciate being able to hire someone who cares about the way his work looks even years after he finishes. I'll be hiring Jon for any other projects I do in the future." 5★★★★★ - "Jon is the best! We wanted to finish the basement in the home we'd just bought, and brought in several contractors to discuss the potential work. Jon was the only one who presented us with a plan that was specific to our wants and concerns. He listens. His proposal was very detailed and transparent. And his pricing was competitive. It was an easy decision to choose him to do the project. As the work progressed, the communication was terrific. We always knew exactly where things stood. And Jon's commitment to doing things in the absolute best way possible, borders on obsessive. There were many points during the project where I know most contractors would have taken shortcuts, or gone with a quick and lazy solution, so we feel very fortunate that Jon was in charge of the project, and not anyone else. He made sure that the end result turned out amazing! We would absolutely want Jon to handle any projects we have in the future." 5★★★★★ - "Jon has done 3 different projects for us that were amazing. He did a trex deck to perfection. He took care of all the permits and drawings which made it very easy for us. He made sure that the CO was obtained. Everyone that sees our deck comments on the perfection. Jon has also done tile work and crown molding which came out to perfection. We would highly recommend his work. He takes pride in what he does." 5★★★★★ - "We've been working with Johnathan from Allure Home Improvement for many years. He's honest and trustworthy and one of those rare guys who does what he says he will do." "WOW!! Our house is BEAUTIFULL! Allure Home Improvement & Remodeling, LLC enclosed and converted our outdoor porch into a new master bedroom closet and additional family room space. Allure also installed new Certainteed vinyl siding on our ranch style house, new gutters and re-tipped the chimney. Jon and the various tradesmen working on our property did an outstanding job! We passed every inspection throughout the remodeling with no problems. Jon is professional, trustworthy, reliable and a joy to work with!" 5★★★★★ - "Jon did a great job, despite a few setbacks with permits. He worked very hard to get my project going, and once we finally started he worked quickly to finish the job ahead of schedule. I am very happy with the results! He added a composite deck, framed it with contrasting color and rails -- beautiful work. I hope to hire him again." 5★★★★★ - "We are very happy with Jon, his work, the people he used & his supervision of the project. Very engaged, honest and personable, Jon stayed on top of the project from start to finish always communicating status and plans for the next day or phase. You will not regret having Jon manage your project...he is clearly in charge & has good contacts for every phase of work. Highly recommended!" 5★★★★★ - "Our basement recently flooded and we hired Jon for the repairs, which were to include putting new sheetrock in water damaged areas as well as a complete re-sheetrocking of our laundry room, along with the installation of a tile floor in the whole basement. Jon and his crew were very professional in every aspect and did a terrific job overall. He was always on time and was very respectful to us. The tile floor that Jon installed showed his craftsmanship skills and great attention to detail. Now, after all work is complete, we are VERY pleased with the final outcome and would highly recommend Jon to anyone in need of home repairs/remodeling." 5★★★★★ - "Allure wanted the project to be perfect and Allure made sure all phases of the project was perfect. We, the homeowners, were very satisfied with our perfect deck." 5★★★★★ - "Jon did a great job in converting our office into a bedroom. He installed a wall and closet, with built in shelving, and exhibited professionalism and skill at every turn. I intend to hire Jon again for our next project." 5★★★★★ - "Jon was very helpful in the design of our deck and porch. His workmanship and attention to detail was excellent." 5★★★★★ - "John was very professional. Did a good job, even though it was an older home and was a little more difficult. Always arrived on time, would recommend." 5★★★★★ - "Jon was very professional. Completed all jobs with high quality and in great time. He was also very helpful in catering to our needs as they developed during our basement remodeling project. Very highly recommended!" 5★★★★★ - "John was very professional and all work was done in a timely manner. John, the owner the company, was on the job promptly every day. He answered all of my questions in a courteous manner and listened to any suggestions that I had. The job was finished on time, within budget. We we happy with the job that he did, therefore we are having him do more projects around the house."